Buy the Series & Save! 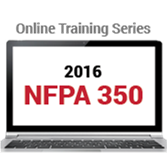 Introducing the NFPA 350 Online Training Series dedicated to protecting workers from confined space hazards. Workers entering or working in confined spaces often face life-threatening hazards and by law, employers must comply with applicable OSHA regulations such as 29 CFR 1910.146 and 29 CFR 1926 Subpart AA to ensure personnel safety. Make sure facility managers, risk managers, safety directors, and others are informed and ready to implement the confined space entry and work procedures covered in the all-new NFPA 350 Online Training Series. The three interactive courses in this series show users how to recognize, evaluate, and control hazards using the latest safety guidelines in NFPA 350: Guide for Safe Confined Space Entry and Work. Three one-hour online modules use a combination of scenario-based interactive exercises, onscreen visuals, and video to explain how to protect personnel who enter into confined spaces for inspection or testing or to perform associated work. Knowledge checks and printable job aids help ensure you're ready to apply concepts effectively on the job. Anyone who designs, enters or works in confined spaces, or supervises workers in a facility that has one or more confined spaces including facility managers, risk managers, safety directors, architects, engineers, industrial hygienists, construction workers, and technicians. Complete this three-hour course series and qualify for 0.3 CEUs Completion of each individual one-hour course qualifies you for 0.1 CEU. Upon successful completion of a course or the course series, participants will be prompted to download the CEU certificate directly from the course site. Identify hazards in and around confined spaces -- before workers take life-threatening risks -- with this all-new online course based on new NFPA 350. Hazard Recognition in Confined Spaces, the first module in the interactive new NFPA 350 Online Training Series, addresses the critical issues to consider regarding potentially deadly hazards in and around confined spaces in a wide array of industries. You'll learn how to recognize what a confined space is, and identify the types of hazards workers will face -- including hazards unique to specific industries such as water treatment, petrochemical, and agricultural. Lessons are based on the latest safety guidelines in the NFPA 350: Guide for Safe Confined Space Entry and Work. The one-hour online module uses a combination of scenario-based exercises, onscreen visuals, and video to explain how to protect personnel who enter into confined spaces for inspection or testing or to perform associated work. Knowledge checks and printable job aids help ensure you're ready to apply concepts effectively on the job. Learn how to evaluate hazards in confined spaces and protect workers in your facility with this all-new online course based on NFPA 350. OSHA regulations such as 29 CFR 1910.146 and 29 CFR 1926 Subpart AA are required for entry or work in confined spaces, and NFPA 350 presents user-friendly protocols to adopt into your company's safety plan and implement immediately. Hazard Evaluation in Confined Spaces, the second module in the interactive new NFPA 350 Online Training Series, covers the crucial steps for evaluating a confined space for hazards. Learn how to determine whether or not conditions are acceptable for personnel to enter and work safely. The one-hour online module uses a combination of scenario-based exercises, onscreen visuals, and video to present the safety guidelines in NFPA 350: Guide for Safe Confined Space Entry and Work. Knowledge checks and printable job aids help ensure you're ready to apply concepts effectively on the job. Learn about hazard control, ventilation, permitting, and rescue planning for confined spaces work in this all-new NFPA 350 online course. The one-hour online module uses a combination of scenario-based exercises, onscreen visuals, and video to share concepts. Knowledge checks and printable job aids help ensure you're ready to apply concepts effectively on the job. The program also reviews NFPA 350 guidance for protecting facilities, equipment, non–confined space personnel, and the public from injuries associated with confined space incidents. View this FREE interactive demonstration of a NFPA 350: Safe Confined Space Entry and Work (2016) course!